As Christians, we place our trust in the Captain of our vessel. 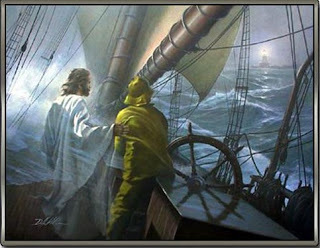 While the waves may cover us, He shields us from total disaster. And, while we go about our duties, though weary from work with little rest, it is His strength that sustains us, not our own that glorifies Him; but His strength alone, demonstrated through us, that unifies His spirit across all who are part of His divine plan. Somehow, we must "let go" of His helm, trusting that His alignment of all that is necessary to bring Him glory is realized. But, how can we let go? Trust, faith, a deep breath , and in humility, on our knees, give it ALL to the Captain. Then, continue swabbing the deck... He's got this! Amen.